As we noted yesterday, Alice Rothchild has been filing from Palestine. This post first appeared on Pluto Press’s blog. After weeks of anxiety and worrisome emails about security at Ben Gurion Airport, possible demands for passwords, email addresses, and various troublesome questions, the 18 year old at passport control barely made eye contact. I could see her iPod dangling from her ears. I don’t think she saw me at all. 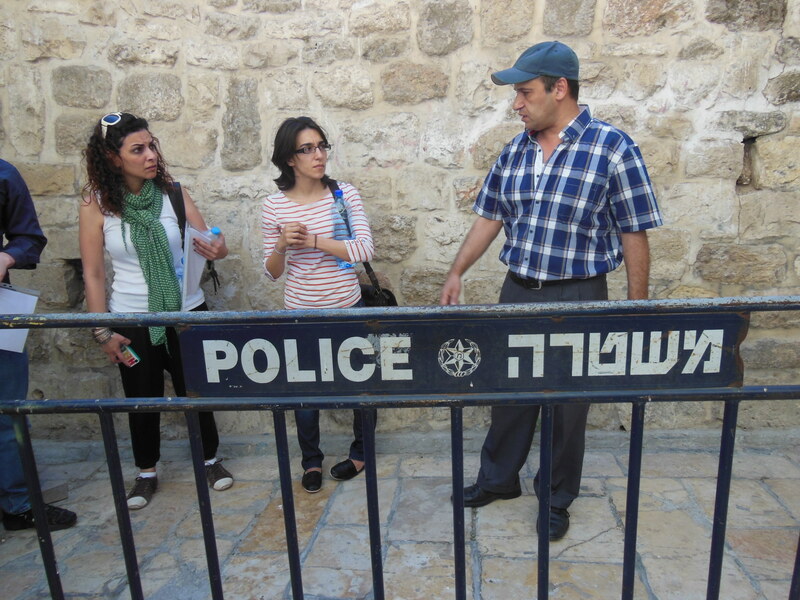 This is day one of the American Jews for a Just Peace – Health and Human Rights Project, and we begin in the Old City of Jerusalem, in the Al Quds Community Action Center established in 2000 to serve the needs of the Palestinian Jerusalemite community. Hamad Shihabi is an attorney who works on the tortured legal issues facing East Jerusalemites, Palestinians who since 1967 have the unfortunate combination of an Israeli residency ID, but no citizenship. They are faced with a myriad of challenges including home demolitions, barriers to family reunification, lack of adequate national insurance (which includes medical, disability, social security), taxes without adequate local services, and face-offs with the malignant Department of Antiquities. Their precious IDs can be easily revoked by Israeli authorities and in 2008, more than 4000 East Jerusalemites lost their IDs out of a population of 250,000. At that point they became stateless, and began a byzantine and circuitous legal struggle to nowhere. Hamad’s personal story is equally disturbing: a father who is an originally from East Jerusalem but has a West Bank ID, family lands lost in 1948 and 1967. His mother has an East Jerusalem ID, but their home which was once in Jerusalem is now outside of the city so they rent in Beit Hanina which is in the city. Because of the different IDs and the lack of family reunification, his father has to travel separately and go through different checkpoints than the rest of the family. I listen to all of this in my post travel exhaustion and think, once again I have arrived in a land of official insanity! Then I remember the overarching goal: to force Palestinians one way or the other, to leave their historic and ancestral homes. We make our way through the winding streets of the Old City, up and down stairs, through dark dusty stone tunnels and glorious snatches of sun to the Shehaba family quarters. One hundred people from 22 families live in 120 rooms, curling around dark stairways, opening into bright courtyards, kids tumbling and playing, a kitchen tucked behind a door, a glimpse of a living room. Their papers date back to 400 years of documented ownership as a waqf, a form of Islamic trusteeship designed to protect the family from dispossession. 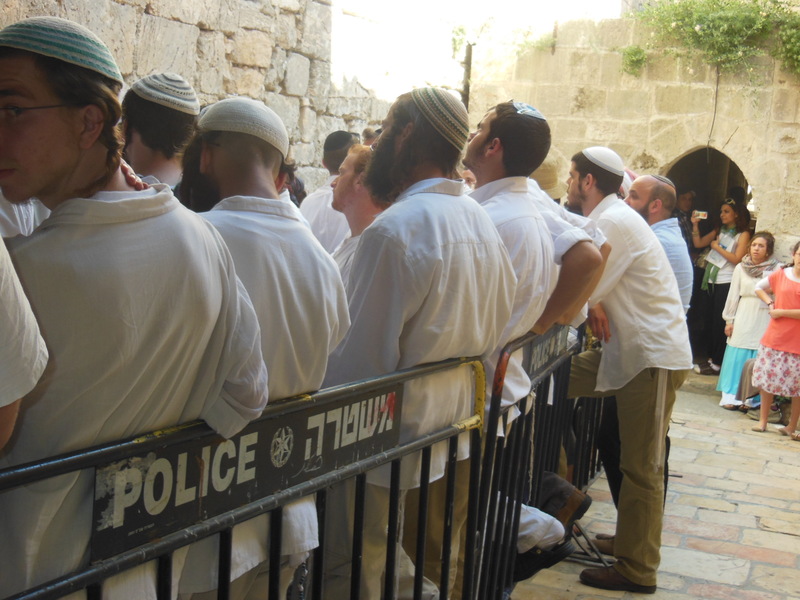 As if this is some kind of bad movie, by the time we get to the bottom of the stairs at the entry to the family quarters, a large crowd of ultra Orthodox Jews has gathered to pray, loudly and boisterously in their self assured religiosity. They are guarded by a cluster of soldiers with large automatic weapons and a clear intent to use them if needed. Dropped down the rabbit hole again. Welcome to the Holy Land. And that was the fantasy. The return would usher in a golden age. Anyway Israel is now a poster boy for bad government. And they never last. Thanks for sharing, Ms. Rothschild. Informative. Imagine what that Arab Idol young man from Gaza has experienced in his life. I hope he gets as big as Elvis.